What makes our heat pumps so unique and so reliable? Durability. 10,000 Hour Continuous Operation Simulation. Today, Panasonic air conditioners have earned widespread acclaim throughout the world. A rugged design ensures that the air conditioner will continue to keep the room comfortable, and operate trouble-free for many years. 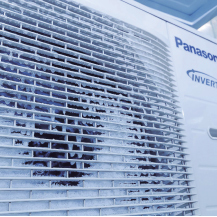 Panasonic believes this is the true value of an air conditioner. And this is why we subject them to a wide range of stringent tests. The air conditioner's main mission is to provide a level of durability that allows it to operate stably for years. 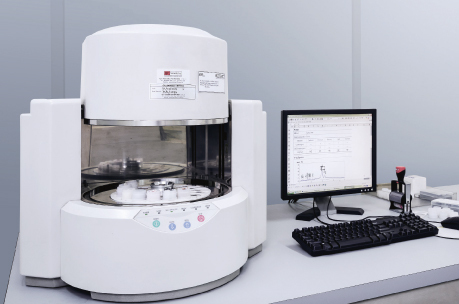 In order to achieve this, we conduct an accelerated test for 10,000 hours of continuous operation. 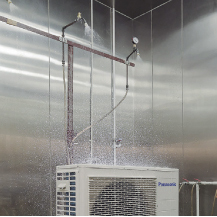 The results of this test, which is conducted under conditions that are much more severe than actual operating conditions, prove the rugged strength of Panasonic air conditioners. 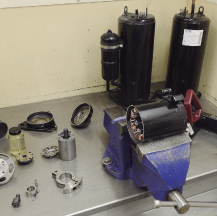 After a test with 10,000 hours of continuous operation, we remove the compressor from a randomly selected outdoor unit, disassemble it, then examine the internal mechanisms and parts for possible failure. Panasonic air conditioners continue to provide their designed performance for many years even after prolonged operation under harsh conditions. 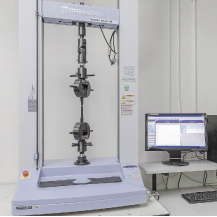 In addition to normal operating conditions, an operating durability test is conducted in a high-temperature, high humidity test chamber at a temperature of 55 ºC. 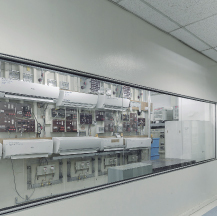 For use in cold climates, the test is also conducted in a low temperature test chamber at -20 ºC. This test assures that the oil inside the compressor will not freeze during use and interrupt operation. The outdoor unit, which is subject to rain and wind, is provided with IPX4 waterproof compliance. Contact sections on printed circuit boards are also resin-potted to prevent adverse effects caused by an unlikely exposure to droplets of water. No Breaking. When Dropped onto Sides or Corners. 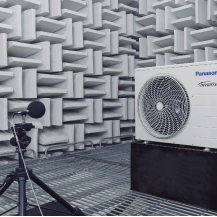 Panasonic simulates impacts, vibrations and other environmental conditions that air conditioners might be subjected to during transport. We promise that the quality and performance at the time of the final product inspection are unchanged when the product reaches the user's home. 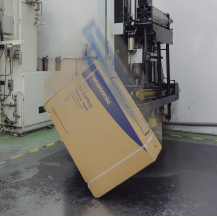 Even with the large impacts that may occur due to improper handling during transportation, the product packaging has been strengthened to prevent it from being damaged. 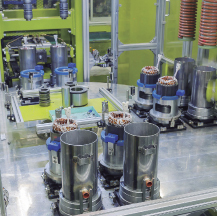 In addition to conventional vertical dropping, more severe conditions in which the sides or corners hit the floor first are carefully tested to ensure that the product's rigidity and shock-absorbing materials work to prevent problems. 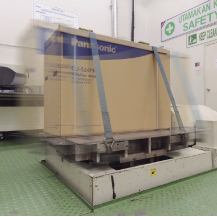 Preventing damage that would hinder the product's performance due to vibration during transport is a major role of the packaging. Panasonic confirms that the product operates properly even after applying vibrations in both horizontal and vertical directions. During distribution, products may be subjected to extended warehouse storage under unfavourable conditions. 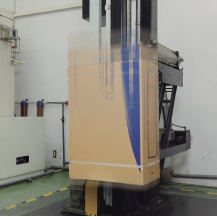 To simulate these conditions, we place a weight equal to a stack of five product packages on top of the test package, and leave it in that condition in a room at a temperature of 27 C and a humidity level of 85%. Then, the product is checked for proper operation. Silence. That Does Not Disturb You. Air conditioners should keep each person in the room comfortable without making their presence known. They should work totally in the background, using their strength to create and maintain a relaxing environment. We build this hidden strength into our air conditioners, and test them repeatedly from this viewpoint. The operating noise of the indoor and outdoor units is measured in an echo-free chamber. The noise test verifies that the operating noise is low enough so that the product operation will not disturb daily activities including conversations and sleep. 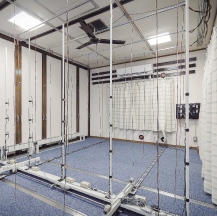 An actual air conditioner is operated in a test room that simulates an ordinary living room. Conditions such as the amount of sunlight entering the room from outside are changed while measuring a variety of parameters, such as cooling speed, cooling efficiency, and temperature and humidity differences throughout the room. This makes it possible to confirm whether the air conditioner is operating at its designed performance level under ordinary conditions. 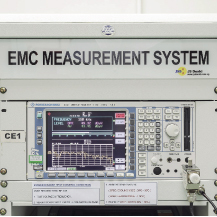 This test determines whether electromagnetic waves emitted during operation are sufficiently low to prevent adverse effects, i.e., electrical noise, on signals such as TV and radio broadcasts. 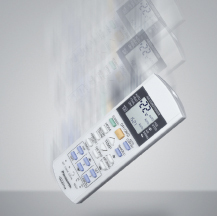 Because the remote control is the main interface between people and the air conditioner, it is naturally subjected to frequent impacts - such as drops and bumps - when it is passed from person to person during normal operation. 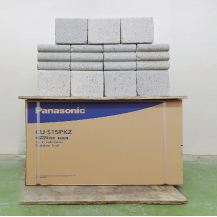 Panasonic drops the remote control from a height of 1.5 metres at various angles to ensure that no problems in basic performance will result from accidental dropping. Quality. Is at the Core of All Our Manufacturing. Over the years, Panasonic air conditioners have continued to offer the highest possible quality with the lowest environmental impact worldwide. Naturally, the fundamental production principles that are common to all Panasonic products apply to air conditioners as well. The fact that these principles actively support every product, rather than simply serving as slogans, is the result of the endless repetition of challenges and trial-and-error efforts that are conducted at our production bases all over the world. Panasonic air conditioners comply with all of the major standards that maintain high reliability in the countries and regions where they are marketed. 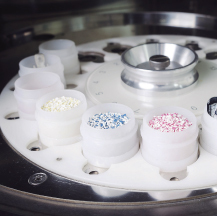 To ensure this, we conduct a variety of tests to examine the quality of materials used in parts. The strength of the resin material used in the propeller fan is confirmed by the tension test. All parts and materials comply with RoHS/REACH, Europe's world-leading environmental regulations. Stringent inspections of more than 100 materials are conducted to ensure that no hazardous substances are included during parts development. The air conditioner production line uses advanced, state-of-the-art factory automation technologies to produce products with higher reliability. Products are efficiently manufactured with high and uniform quality. 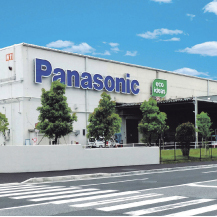 Panasonic has set up eco ideas factories around the globe. While developing and manufacturing energy-saving products based on original environmental technologies, these factories reduce CO2 emissions from manufacturing processes and conduct regional-based environmental communication activities to contribute to both the global environment and the local communities that they serve.